The location: The Harbor School. A. A private high school attended by Ryan, Marissa, Summer, Seth, Luke, and other characters from the show. A. Harbor school is seen in virtually every episode of "The O.C. ", during the first two seasons, beginning with Episode 8 in Season one, when Ryan (fresh from Chino) enrolls in the private school. With the exception of The Pier, Harbor school has probably been seen more often than any other filming location on the show. Even in the fourth season, after the main kids had graduated from Harbor, they continuted to show the school because Marissa's sister, Kaitlin, went there. A. Most of the scenes from "The O.C." are shot along a stretch of South Bay coast running from Marina Del Rey on the north to Long Beach on the south. The Harbor School is the one big exception. So, you won't be able to include it in a casual drive around Hermosa and Redondo - you'll need to make a special trip to see this location. (The nearest other "O.C." location would be Marina Del Rey, about 12 miles away.) And for what it's worth, it's also about 57 miles northwest of the real Newport Beach. 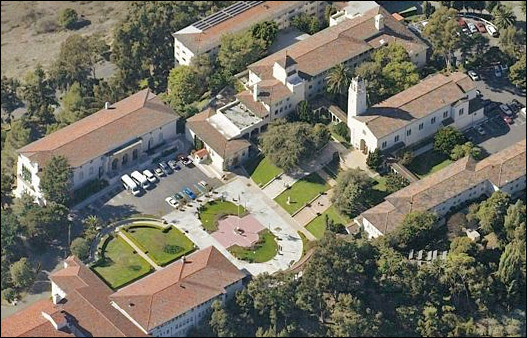 To the right, you'll see an actual aerial photo of the school. Interestingly enough, the director tells us that they originally considered using Torrance High in the South Bay, the same school seen in "Buffy the Vampire Slayer" and "Beverly Hills 90210". That location would have been very close to the show's other regular spots. But he wanted something different. When he saw Mount Saint Mary's, he knew he had found what he wanted. Although Mount Saint Mary's is a private college, they welcome visitors to the campus. It is a gorgeous campus, located on top of a mountain with spectacular views. As you can see on the show, it offers wonderful architecture, and you'll immediately recognize the stone steps and circular quad seen in virtually every episode of the show. Here is a map link to the exact location. And here is a link to the college's official website. A. A little personal history helped a lot. When I was a kid, my aunt Phyllis went to Mount Saint Mary's on a regular basis, and she once took me along and showed me the campus. It's a beautiful campus (with spectacular mountain views) that's hard to forget. I recognized it immediately when I saw it on "The O.C." - despite the fact that the producers did their best to hide the fact that it is actually a Catholic women's college.